Who said indulging in burgers has to be unhealthy? 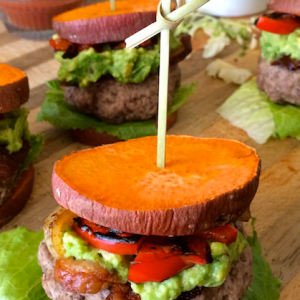 Check out this grain-free, paleo slider recipe! Preheat the oven to 400°F (204°C). Wash the sweet potato and cut into ½ inch (1.27 cm) slices. Line two baking sheets with foil or parchment paper, lightly coat one with olive oil or fat of choice and lay out the sweet potato slices. You will need 12 slices. Lay out the bacon on the other sheet. Bake both for 20−25 minutes. Flip the bacon and sweet potatoes halfway through. While the sweet potatoes and bacon cook prepare the burgers, bell pepper and onions, and smash the avocado. In a medium bowl combine the ground beef, minced garlic, salt and pepper and form into six patties. Heat olive oil or fat of choice in a large skillet over medium heat and add the patties. Cook for about 5 minutes on each side. Heat olive oil or fat of choice in a separate small skillet over medium heat and cook the bell pepper and onions until soft and slightly charred. In a medium bowl smash together the avocado and lime juice. Add salt and pepper to taste. Assemble each slider by topping a sweet potato slice with lettuce, a burger patty, bacon, smashed avocado, bell pepper and onions and another sweet potato slice.